Haha, GAG is not a lemon! Mel has received strong and sufficient support to proceed to DD with 20 YES votes of 23 votes cast. Now Uli is off to assemble his DD team to grill Mel, maybe more so her co-founder Rudi. Talking of non-lemons, remember the You've been TANGO'd ads? Despite a near perfect pitch from Mel, Geo AR Games had to concede first place at last night's Finals Gala of Zino's 2018 New Kiwis Challenge to Nicky SHANG and WuKong Education, all about teaching Chinese to second generation expat Chinese. Congrats to Nicky and his team! Nawaz is our new FKApprentice and brings more facial hair to this job than all his predecessors combined. He is only challenging Chewbacca Jai in this department. Nawaz brings a wealth of relevant experience from Chiasma and Uniservices, both linking university with hi-tech industry, Dasset in the blockchain realm, his own startup Kimera and he brings a healthy dose of smarts from his bioscience masters. PS Jai has long since shaved, smooth to sightlike the proverbial baby's bottom. It is AAA time again! Wednesday 5 September, 18:00 @ Simmonds Stewart, Level 4, 4 Vulcan Lane, Auckland 1010. ☞ more here. Also, 3x ADI.Clinic next week in Wanaka, Whangarei and Auckland. Marcel van den Assum in da chair, run for da exit! He has done it again, flicked off Flick. He was instrumental in Green Button exit. He was chair of the Angel Associaton but nothing to sell there. He is chair of Wipster where Rudi and several other FKAngels are shareholders and hoping for more of that Marcel Magic. Flick is rumoured to be a 4x exit for most investors which is pretty good going given that Steve O'Connor only formed the company in late 2013 after he set up the first Lightning Lab for Creative HQ. All mistakes, grammar, spelling or otherwise in this publication have been made by Rudi and then overlooked by Debbie, Jackie, Karl, Katheren and Masha. Same goes for the images. However, Rudi has been known to insert some after the early morning review. Tuesday was FKA Pitch Night! Mel from Geo AR Games gave a great presentation but watch for yourself. Uli is the champion for this deal and the DD Vote is underway. If at least 17 of our 32 Voting FKAngels say 'Yes, let's do DD', Uli will lead the charge. Email him if you want to help. We had a fun pitch night thanks to our fabulous hosts and sponsors from Potentia. Not only food and drink, they also provided entertainment after our CCH had seeded the idea of a sabrage with them. CEO Nathan Bryant-Taukiri took three strikes with a big sword to open a piccolo bottle, whilst Karin Enderle took only two with a kitchen knife to open a standard size bottle of champagne. At this point, we refrain from of the many obvious commentary angles around size, gender and nationality. Karin is from Germany and her surname derives from "Andreas", meaning manly, and was held by the first of Christ's disciples. Thank you also to the crew from Moxion who shot and processed the video for the benefit of everyone who couldn't be there on Tuesday. To be safe we've appointed Jai and Garth to replace Tim as he steps off the FKA Board after two years to focus more on Ambit, the chatbot startup that proves FKAngels (Josh and Tim) can be co-founders too. Tim will continue to support the Board informally with his wealth of investment expertise from Goldman Sachs days. Charlie, Josh and Rudi say "Thank you, Tim, it's been awesome working with you on the board!" Newbies Jai and Garth say "We'll not attempt to emulate your style... but we will endeavour to do our best on the Board!" Another sabrage? Don't forget to grab your ticket to the Finals Gala of Zino's 2018 NKC. Geo AR Games is one of the three contenders for first place. Of the many useful prizes in this competition, they have already picked up an all-expenses-paid trip to China later this year. BE THERE! Thu 30 Aug, 17:30+ Register here for FREE entry! Emma McMulkin from MYOB is extending a warm welcome to FKAngels and other interested readers to attend the pitch night that completes their Hᴇᴀᴅ Sᴛᴀʀᴛ Fᴏʀ Sᴛᴀʀᴛ Uᴘs competition. $100k of prizes, food and drink galore. What's not to like? Thu 20 Sep, 18:00 ? Full details and FREE registration here. Debra and Cornelius wanted to share this great news about Yabble. "Outstanding recognition of outstanding work and partnership. Well done to Kathryn, Rachel and all your team." We halted DD on Yabble last month to give them more time to build traction and validate more of the assumptions in their business model. They keep doing good stuff, clearly, one to watch. 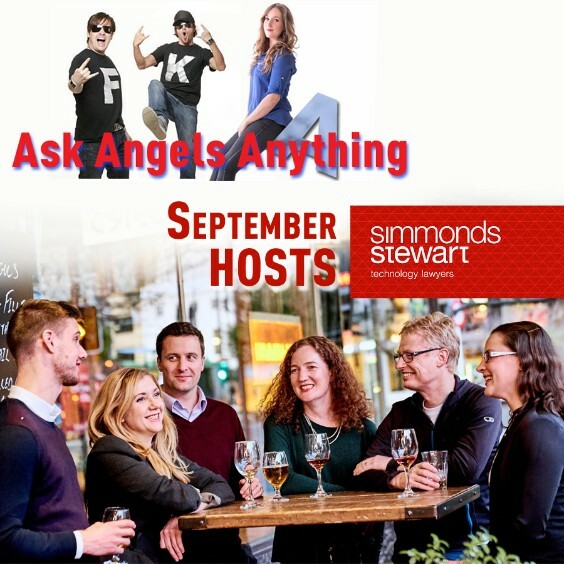 "As Chief Cat Herder, how well do you know your angels?" CCH fibs "You know that you know your angels well when you know their preferred brand of toilet paper." Toothcrush was all about putting bamboo toothbrushes in your mouth, SmartAss.co.nz is all about bamboo toilet paper. James from Toothcrush is a fan and so is Debra, as she proclaimed at a recent branding workshop she ran for Jackie at the ecentre. All mistakes, grammar, spelling or otherwise, in this publication have been made by Rudi and then overlooked by Debbie, Jackie, Karl, Katheren and Masha. Same goes for the images. However, Rudi has been known to insert some after the early morning review. Next Tuesday 21 August at 18:30 will be our 43rd Pitch Night. This one hosted by our potent sponsors Potentia. Nate and Julian reckon a sabrage is in order. Good idea ? Uli is bringing one of the Top Three entries from Zino's New Kiwis Challenge: Geo AR Games. Mel the CEO pitched to us before in 2016. She was selling to councils then which was a turnoff. She gets that now but reckons we'll love her pivot to a new exciting market. PItch Nights: Potential angels, other syndication partners and all our sponsors are always welcome to attend; stock, insurance and other brokers touting for business not so. The first point of contact for founders is our ADI.Clinic. If unsure, come as the guest of one of our angels. OMG! We ran ADI.Clinic sessions in 4 locations this week and met with 13 founders. A big thank you to all the mentors who make this happen. Hi5 to Brian who has completed the first ADI.Clinic in Blenheim for Angel Investors Marlborough. Also this week, Debra and Rudi were judging with Alex Mercer at the annual Angel at My Table event of the NZ Software Association. That has generated more leads for ADI.Clinic. Alex is with ArcAngels which should qualify the gender ambiguity of her first name. Garth Hinton has jumped into the deep end as champion and now investor rep for FileInvite. That and his willingness to regularly help with ADI.Clinic and DD mean he has a good grasp of what FKA is about. After a legless night with Tim Gelston, he is also helping a startup that is leveraging StretchSense tech for a smart knee brace. Garth and Tim? A mixed blessing, some might say, but not founder Arien Hielkema. Garth is stepping onto the FKA Board and wants to strengthen our Post Investment Managment. AWESOME! The photo has to be the most fiery shot of Garth on planet earth, in fact, the most fiery shot of any ex-banker. Zino's 2018 NKC has been a great experience for the founders and the mentors who took part. It culminates in a big party thanks to Wendy Kerr and her team at Auckland University's Unleash Space. That is when the overall winner out of the current Top Three will be announced. BE THERE! Thu 30 Aug, 17:30+ Register here for FREE attendance. CHH wonders "Can the Zino folk pull off a sabrage?" Josh is an FKAngel like no other and a dog lover too. The dogged humour that he demonstrates in this blog from 2014 has come back to haunt him. The chief GIF maker has made some 2018 additions. It must be humorous pictures like this one and his other humour that have endeared him to the management team at Potentia. So much so that they have jumped on board as active FKA sponsors. Josh is on the FKA board and a very busy cofounder of AI startups Ambit. Nate, Abinesh and Julian @ Potentia, beware of the chief GIF maker! CEO Mel is chuffed to have made it into the Top Three of Zino's New Kiwis Challenge. Now her sights are set on winning the top prize. Uli likes how Geo AR Games is going after Chinese shopping malls and wants to bring Mel & Co FKA's August Pitch Night, Tue 21 August. Rudi has been mentoring them since 2016 and the picture shows once again how FKAngels help Kiwi founders get liftoff. Yabble and FKA have decided to stop DD so that Yabble can get some more runs on the board and prove out more of the international business model. The revenue from their consulting business puts Yabble in a good position to do that. We have a precedent for this with Wherewolf who are now portfolio company #12. Yabble could certainly repeat that - they have a similarly unusual name already. Cornelius will stay in touch with Kathryn and Rachel. Dotterel pitched back in June and the DD process of the lead investor is only now completed. They are now waiting for final commitments from existing shareholders. Once we know if there is any capacity for FKA Rudi and Hattaf will report back. Ralf Wittgen has talked with Jackie, Paul and Rudi. All three reckon he would make a fine FKAssociate. Ralf understands what is expected of him and he is happy to strengthen the German contingent. He is promising to give Rudi a run for his money, little that he has, with his fast and furious, often video enhanced, LinkedIn posts, like this one following Wednesday's Ask Angels Anything event. If anyone knows of any skeletons in the cupboard or any other reasons why he should not join our group, now is the time to speak up. Please advise the board in confidence of any material concerns to consider. Nick Walsh has been a sterling support to the FKA board and wider group as our resident FKApprentice. His persistence in chasing signatures and investor certs is what most you have seen but that was only the tip of a big iceberg. Nick moved to Oz for a master in quantitative finance earlier this year and has still supported us from afar. Now it is time to say goodbye and knuckle down for studies. Thank you so much, Nick! We want to see you back with FKA as founder or angel. Keep going the way you are!!! He says, he'll miss ADI.Clinic and the Pitch Nights most! Oh, and Charlie. Ray Thomson has been a force to be reckoned with in the NZ angel community. His style was divisive, he didn't mince his words, but by god did he get stuff done. He pushed CCH Rudi to grow his wings and cat herding skills faster then he'd ever expected. No doubt, Ray's recent passing leaves a hole that will take time to fill. See the many reactions that have accumulated on Rudi's post here. ✞ Funeral service Tue, 14 Aug, 11:30, Holy Trinity Cathedral, Parnell. Andrew and Julie will share their experience helping tech companies develop and negotiate term sheets for deals from small friends and family rounds through to large VC and private equity deals. They will also go through the creation of a term sheet using the equity investment term sheet doc maker, a powerful tool for founders or investors alike. Unexpected news from a law firm: The doc maker is FREE to use! A must for all current and aspiring FKA investor reps!!! A night of coprolalia hosted by Mr Paul Ego of "7 Days" and featuring two of NZ's funniest ladies Mel Bracewell and Justine Smith. Tickets here. Light snacks provided, consider bringing a food platter to share. Cash bar. Doors open 7.00pm. Pre-load at Rudi's next door to TGS (not Dr Rudis). All mistakes, grammar, spelling or otherwise, in this publication have been made by Rudi and then overlooked by Debbie, Jackie, Karl, Katheren and Masha. Same goes for all images, however, Rudi has been known to insert some after the early morning review. As it is the case with this little insert. Clever names or photos often inspire the GIF animations for this publication. It is obvious in this case that it was the wordplay and not the picture of Wayne Hudson who is the clean-shaven complement to Charlie James at our Wanaka ADI.Clinic. He is also the Ⓗ in HGM Legal. The self-inflicted branding of his boutique Wanaka practice is very different from the corporate HGM brand. He is, of course, one of the most respected NZ IP experts. Some have suggested this would a perfect 'corporate' video for WHipIT! Jai Somaratne is the first awesome addition to the FKA board, not just because of his impressive facial hair. It must have been in a moment of temporary insanity when he volunteered the Chewbacca pic taken at a bankers' fancy dress party. Nowadays he is not so much putting down money but rather more pavers at PaveCraft. The 20 LPs of LP1 should have received their respective copy of the 2018 tax return by email overnight. You know who you are and if you cannot find it in your inbox, there is no shame in that, just ping CCH. Uli and Co have worked with the Toothcrush team through DD. Among other things, this means that there has been a lot of product testing, aka toothbrushing going on in the DD team. With a shift in the business model, the need for funding reduced and based on their strong cash flows our team suggested they look at bank financing. Cut a long story short, Toothcrush succeeded in getting their US market entry financed by their bank which is a great outcome. We wish cofounders Anabel and James all the best for the road ahead and hope they'll pick up with us again when they need more growth capital for the next stage. Banks may not always play so nice. Ask Jai or Garth, they know all about risk management at banks! Thanks again to the sterling DD Team! Dan Burrill, Garth Hinton, Marisa Fong, Melanie Langlotz, Phil Southward, Tim Gelston, Uli Wiehle. ADI.Clinic is going from strength to strength. Brian Dawson has vowed to abide by the ADI code of practice and will be running clinics in Blenheim with our fellow angel group, the AIM Angel Investors Marlborough. Charlie James is finally escaping the confines of Wanaka and will have another go this year at running clinics in Queenstown. Top of the list, however, has to be Campbell Scott, with Takapuna generating more bookings than Auckland this week. Good reason for Campbell to don what is called a fat suit in the film industry before making a splash. Now, let's make sure we're in Blenheim when they have reason to open bottles of booze. AANZ Summit would be a good opportunity! Last night saw the announcement of the Top 5 contenders in the 2018 Kiwi Challenge. Geo AR Games is one of them and already pitched to FKA in June 2016. Their council focus was a turnoff then. Although they extracted more money from councils, than could be expected, it is their recent pivot to Chinese shopping malls which makes them look very interesting. Rudi has kept mentoring the founder and CEO Mel since the pitch in 2016. Uli was on the Zino judging panel and likes the new model so much, that Rudi could twist his arm to be the champion for Geo AR Games and bring Mel to our pitch night this month. Funny thing is, all three - Mel, Rudi and Uli are German. So the Germans are going after the Chinese retail sector with massive support from Zino. Who in turn have massive support from Debra who is driving, literally whipping, the 2018 New Kiwis Challenge forward! Serendipity! 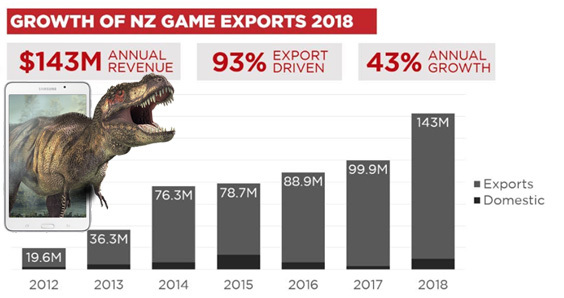 The NZ Game Developer Association released some interesting stats on the very same day. The local game industry shows strong growth over recent years and is predominantly export-oriented. The full report is an interesting read, read it on our blog. Māori Motor Mouth ROBETT HOLLIS has a big mouth but also Ⓖreat ⓈⓄⒽ. When the editor notifying him by text about last week's 'Uber/Lunch' plug his brief response was: "Man I love your style. Sooooo epic. Haha. You actually rule." CHH "Hahaha." RH "But actually. You rule." "Win A Work Day" was a 2017 initiative of CareersNZ.